With the DPC glued all over our tiny house trailer, the trailer is now prepared for installing our wooden floorboards! Woo. This is such an exciting moment. Soon our tiny house will have a beautiful floor made of cypress wood. What kind of wood to use for wooden floorboards? When choosing the wood for our tiny house floor we had to keep the overall weight of our house in mind. 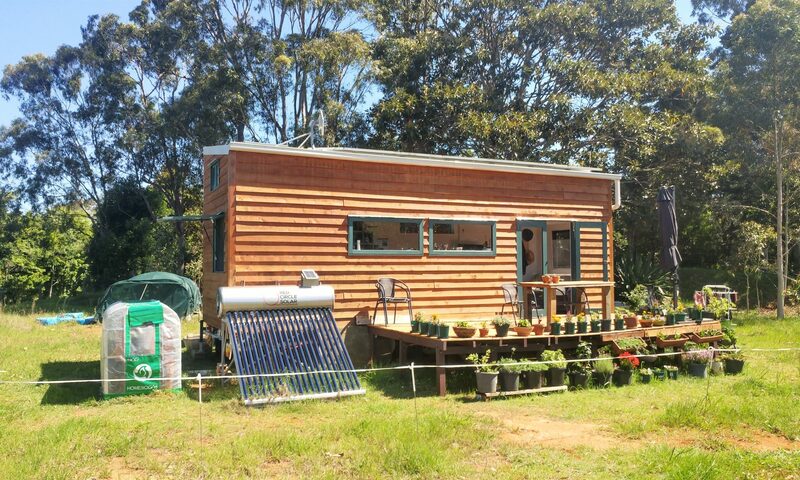 Here in NSW, our tiny house can’t be heavier than 4.5 t. With our trailer already weighing almost 1.5 t, we really have to try to select lightweight materials. Not only for the build but also for the interior. We went to a lot of timber places in our area to get and an idea of the different types of wood. There are some very beautiful options out there but we chose cypress floorboards for the tiny house. Cypress is a very light wood but yet durable and strong. We also went for a tongue and groove solution or T&G. This makes it quite easy to put the floorboards together. We have never installed a wooden floor or any kind of floor in any kind of house. So installing wooden floorboards onto our tiny house trailer is quite a jump into cold water. Obviously, we want our wooden floor to look amazing at the same time we have no experience in this matter at all. Haha. So what do you do in this time and age when you want to pick up a new skill? Right, you youtube it! And this is what we did. We watched videos of how to install floorboards to a tiny house trailer. It’s really not that hard but it requires the right tools, a good method and some kind of preparation beforehand. We’re using wink tek screws to bolt down our floorboards. But in a first step we’re pre-drilling the hole for the plug, then bolt the floorboards down. We started out installing one floorboard after the other but this method is really not very efficient nor is it accurate. So instead we started practising what we learned in one of the tiny house videos! We put three floorboards in a row, squeezed them together tight and then bolted them to the trailer. This method seems to be working nicely. Our floor has fewer gaps and it’s a bit faster too.